The Tulip bungalow is the first type within the sunrise gardens development. Whilst having no attic rooms like the other three types, this bungalow makes up for it with design and quality throughout. The property features a long hallway which leads to the rear, where the kitchen and dining area create a spacious living space. The three bedrooms are a generous size and the biggest bedroom features an en-suite. There is also a second bathroom, finished in an ideal Playa suite and tiled around the shower/bath area. There is also an integral door access to the garage that is ideal for storage. The front gardens are turfed leading onto a buff riven path that leads around the perimeter of the property. 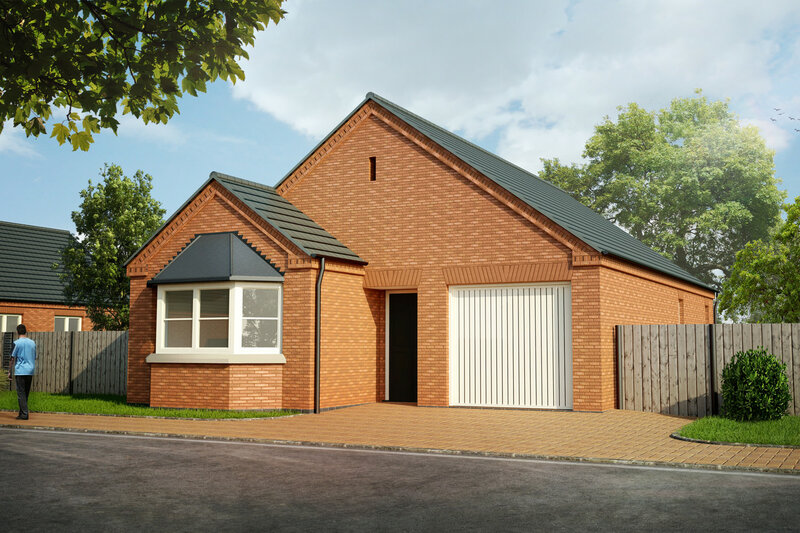 A block paved drive leading to the single integrated garage affords ample parking for two cars. The bathroom features a modern high quality three piece bathroom suite comprising of close coupled WC, a wash hand basin and a panel bath. All with complementary tiled splash backs. The kitchens boasts 200 design choices available. The core kitchen includes a tap, sink and a range of worktops and units with a variety of integrated appliances. Modern vinyl flooring to the hall, kitchen, living area, en-suite and bathroom. However bedroom carpet is not included. Recessed lighting to ceilings in kitchen, bathroom and en-suite. Pendant lighting in all other rooms. Two BT Points. TV points to living room and all bedrooms. Any dulux/crown trade contract colour and white gloss to the woodwork. Professionally turfed rear garden and a blockpaved drive in stonemarket ryton. An outside tap is also included. This property boasts a large conservatory to the rear of the property, adding an elegant touch to its current features. Recessed light to the porch and 2 front entrance lights and 3 rear dawn to dusk lights. One garage, with double socket and one fluorescent light.